These old fashioned frozen dessert recipes were invented by old time ice cream parlor operators to wow their customers, keeping them coming back for more. Imagine making your own fancy ice cream sundae treats that look too good to eat and taste even better. Be prepared to WOW your family and friends. 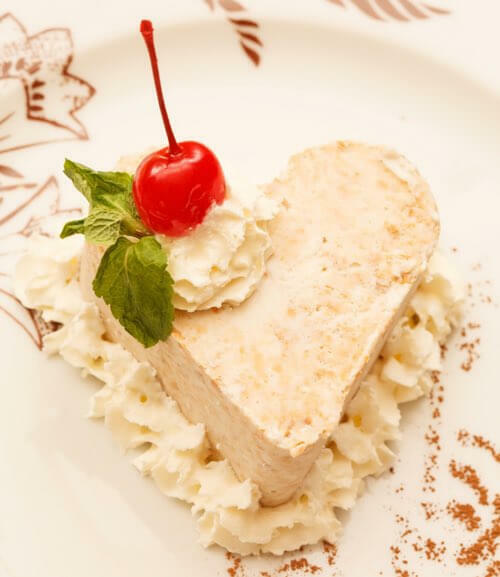 To dispense this sundae have a heart-shaped mold, about 2-1/2 inches in diameter and 1-1/4 inches in depth. In the mold place a layer of vanilla ice cream, a layer of strawberry ice cream, and another layer of vanilla ice cream. Trim the molded ice cream even with the top of the mold, then place the cream on a china plate of fancy design, measuring about 6 inches in diameter. Pour over the cream a ladleful of crushed strawberries, add a spoonful of mixed ground nuts and top off with a spoonful of whipped cream, a cherry, and a sprinkle of ground cinnamon. In dispensing the Northern Lights use a fine china plate, six inches in diameter, decorated with a winter design (e.g., ice and snow). First, place a piece of angel food cake on the plate. Around the angel food lay three slices of orange, on the first of which place a red cherry, on the second a white cherry, and on the third a blue cherry. Now place a (large size) scoop of ice cream on the cake and insert in the top of the ice cream a Veronique wafer, leaving about one inch to appear above the cream (this is to represent the North Pole). Stick a small national flag on the top of the pole. In dispensing "Haystack" use a fine china plate of rose design decoration and measuring six inches in diameter. For the base of the stack use a piece of chocolate cake about 2-1/2 inches square; on this place a scoop (large size) of vanilla ice cream. One each of two sides of the plate place a slice of orange and on each of the other two sides lay a slice of banana. Pour over the cream a heavy caramel syrup, sifting over it shredded coconut which has been previously browned. On top of the stack put a maraschino cherry and lean against the sides of the stack so that they will come to a "peak" four Veronique wafers, arranging them so that the cherry appears to rest on top of the wafers. For this frozen dessert recipe, cut an eclair shell in two lengthwise, place one half on a banana split dish and fill with "Delight" ice cream (see below). Place top on the shell and cover with a ladle of marshmallow topping. Dust over all a sweet powdered chocolate and top with a couple of red maraschino cherries. See instructions for making paper cases further down this page. Secure dainty white paper cases of a square shape; half fill a case with ice cream and then introduce a spoonful of guava jelly, or a layer of chopped nutmeats and figs (or dates). Fill the case even-full of ice cream. Mound the top with whipped cream and garnish with four blanched almond meats arranged like the petals of a flour and with a bit of candied citron for a center. Lay on one side of the plate a spray of crystallized mint, or appropriate garnish, also a square piece of delicate white cake frosted with white and decorated with a slight touch of pale green frosting. This mixture is worth 25 cents. 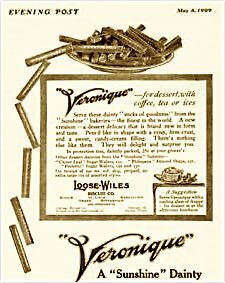 A couple of the old fashioned frozen dessert recipes call for Veronique wafers. Any log-shaped rolled wafer or cookie can be substituted. The vintage Veronique advertisement appeared in the May 1909 edition of the Evening Post magazine. Ice cream and sherbet are often served in small forms or in fancy paper cases, one case serving for each guest. Make and freeze the cream and fill the paper cases with two kinds, either sherbet and plain ice cream, or sherbet and tutti-frutti, or sherbet and a mousse, or any combination that will be agreeable in flavor and harmonize in color. Pack the cases in a freezer, with a layer of waxed paper between each layer of cases. Keep frozen till ready to serve. Serve on a lace-paper napkin laid on a fancy plate. Sometimes the biscuits are covered with a méringue and browned slightly just before serving. Mix together in a deep bowl or pail one pint of "rich" cream, one-third of a cupful of sugar and one teaspoonful of vanilla extract. Put the mixture in a pan of ice water and whip to a stiff froth. Stir this down, and whip again. Skim the froth into a deep dish. When all the cream has been whipped to a froth, fill paper cases with it, and place these in a freezer. Let these remain there two hours. Make a pint of strawberry sherbet. Put a thin layer of it on each case of cream, and return to the freezer. Let the cases stand half an hour longer, and serve. They should be arranged on a bright napkin, spread on a flat dish. One pint of heavy cream, whipped to a froth; a dozen and a half macaroons, three eggs, half a cupful of water, two-thirds of a cupful of sugar, a teaspoonful of vanilla extract. Boil the sugar and water together for half an hour. Beat the eggs well, and stir into the boiling syrup. Place the saucepan containing the mixture in another of boiling water, and beat for eight minutes. Take from the fire, place the saucepan in a pan of cold water, and beat the mixture until it is cold; then add the vanilla flavor and whipped cream. Stir well, and fill paper cases. Have the macaroons browned and rolled fine. Put a layer of the crumbs on the cream in the cases, and freeze. Follow the instructions to make the fancy paper cases called for in some frozen dessert recipes from the late 1800s. Enjoy making the delicious frozen treats from Grandma's day. 1. Cut the paper on the dark lines — there are eight including the outside edges. 2. Crease on every dotted line. 3. At each end turn the parts lettered A over those lettered B, so that the lines "c" rest on the line "d" and one A overlaps the other. 4. Fold the parts B up against the backs of the parts A. 5. Fold outward those parts that are heavily shaded, and fold inward those parts of the [parts B] edges that are lightly shaded [over the outward-folded edges of the backs of the parts A]. 6. Stick the parts of the box together with warm water mixed with a little flour to form a paste. This is unnecessary if the box's shaded edges have been folded properly. Remember that it's simply a box that is to be made, and after the first two steps it may be easy to guess how to complete the work. 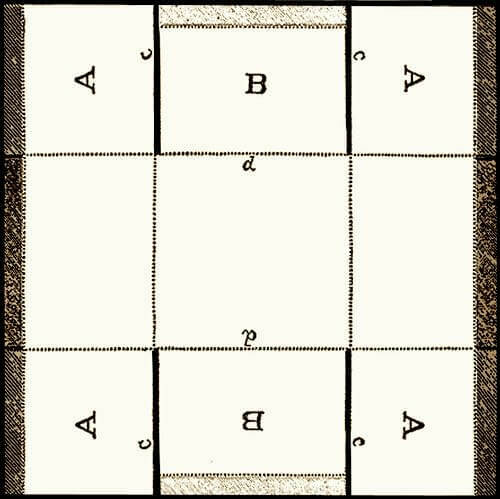 By tracing a copy of the diagram one obtains a good model a fraction of the size the case should be; that is, the square should be five inches on a side instead of the size illustrated. After experimenting with this, the shape may be varied to suit the taste. Stiff white note paper should be used. Cases can sometimes be bought of restaurateurs and pastry shops. They are used with frozen dessert recipes when making biscuit glacé, biscuit soufflé, and other dainties.